James Ewing went on to establish his own practice in Glasgow, with John Tweed as his assistant, while George Ewing himself went out to America in about 1882, perhaps resentful of the dispute over awarding him this commission (see McKenzie 142), or perhaps for health reasons (Nisbet). Photograph and text by Jacqueline Banerjee, 2009. Burns had no particular association with Glasgow, and the move to erect a memorial to him in George Square triggered rival calls for a memorial to Thomas Campbell, a locally- born and -educated poet, also so far overlooked. The monument to Burns was erected in January 1877, and that to Campbell in December 1877. In retrospect, perhaps it was fitting for the city to honour Scotland's most famous poet first. Amid much wrangling, Birmingham-born George Ewing, who had worked in both Liverpool and London, and had studied for a short while under John Gibson in Rome, was selected for the Burns commission. After all, he had been brought up in Scotland and now had a successful practice in Glasgow, where his brother James had recently joined him. The day of the unveiling was declared a public holiday, and a crowd of "over 30,000" collected for the ceremony, further augmented by "trade processions from Glasgow Green" (McKenzie 142). Burns, his features based as usual on the portrait by Alexander Nasmyth, looks robust and at ease, and carries his bonnet in one hand and a small flower in the other. 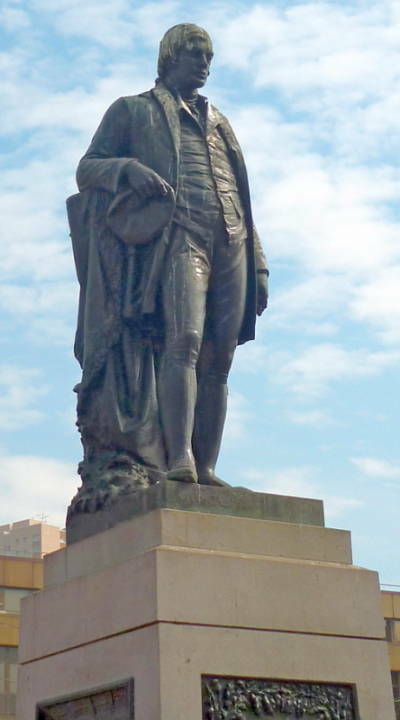 The work, George Ewing's "only public statue in bronze" (Nisbet) compares very favourably with other statues of Burns, for example, those by John Flaxman and Sir John Steell. McKenzie, Ray, with contributions by Gary Nisbet. Public Sculpture of Glasgow. Liverpool: Liverpool University Press, 2002. Nisbet, Gary. "George Edwin Ewing" ("Glasgow — City of Sculpture" site). Viewed 5 October 2009.